So as it turns out, the very last thing I baked in 2010 ended up being one of my favorites. 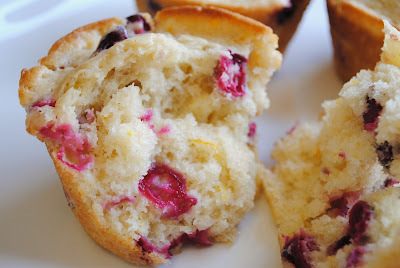 I made these cranberry-orange muffins for breakfast on New Year's Eve and they were delicious. I've been meaning to try them ever since we had a breakfast tailgate for a football game a couple of months ago and we had some muffins from a local bakery here in town. I hate to brag, but I think mine were better. This has convinced me once again that I need to make more recipes from The Pastry Queen cookbook. Everything I've made out of it so far has been delicious. The recipe in the cookbook is for "Essence of Orange Muffins" but as suggested, I added fruit. I used frozen cranberries (like pumpkin I tend to stock up around Thanksgiving when they go on sale). You could substitute fresh or dried cranberries as well. I also used an equal ratio of orange juice to milk instead of 2:1 as the recipe suggested and added a little cinnamon and ginger. I also decided to skip the glaze and topped half with demerara or turbinado sugar and left half plain. The extra sugar gives the tops a nice sweet crunch so I recommend adding it. This is one baked good that its fine to use skim or 2% milk instead of whole milk without any issues as well. I used skim milk and light sour cream with no problems. 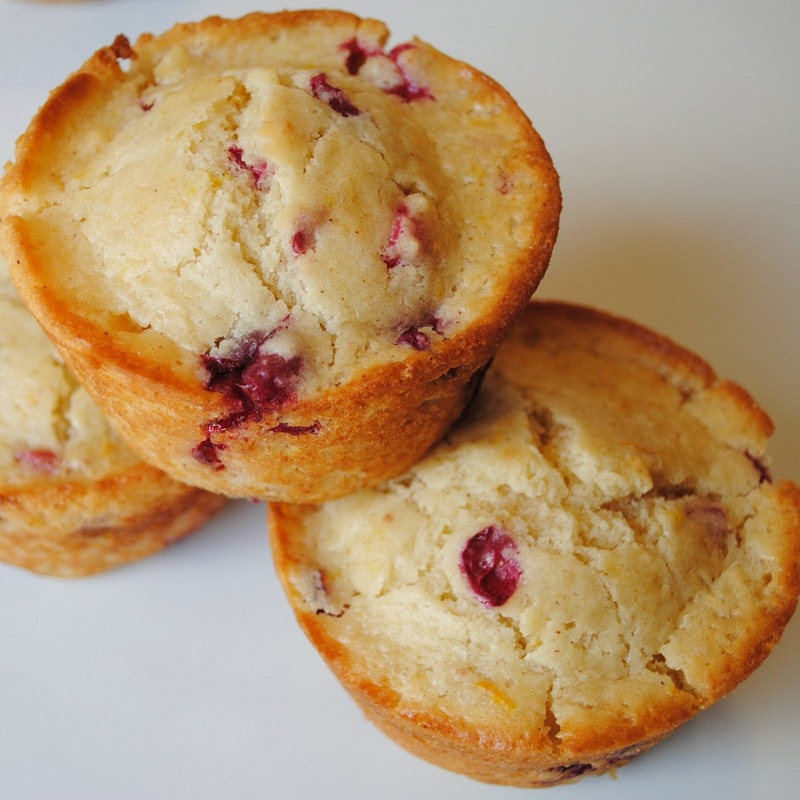 I baked these in a jumbo size muffin pan and the recipe yielded 12 muffins. Preheat oven to 350 degrees. 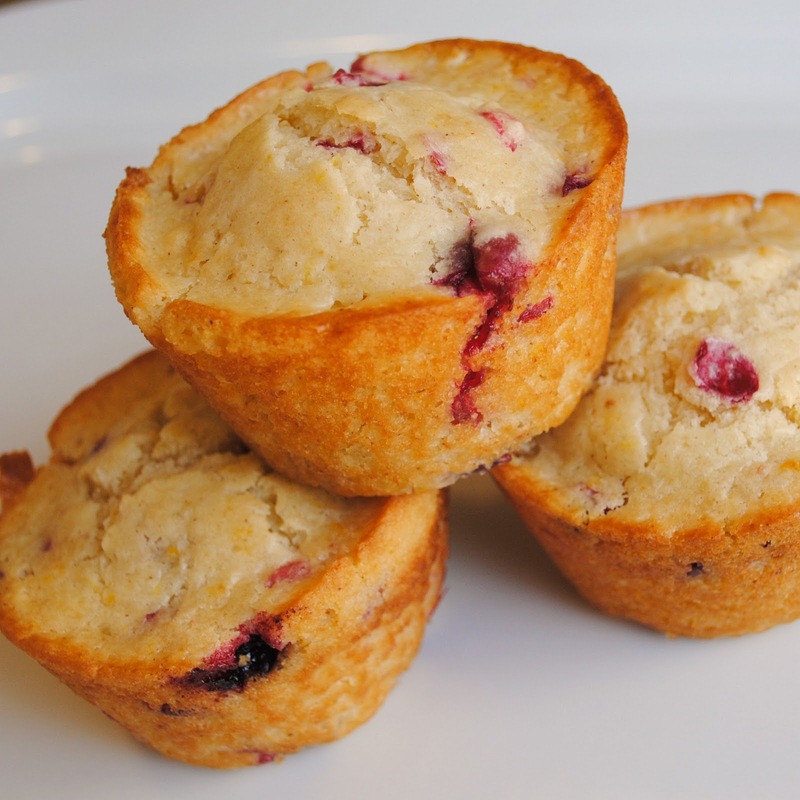 Spray muffin tins with baking spray or line with paper liners. In a medium bowl, combine milk, orange juice, sour cream, eggs, and butter and whisk until well combined. In another mixing bowl, add sugar and orange zest. Use your fingers to rub orange zest into the sugar until distributed and fragrant. Add in flour, baking powder, salt, cinnamon, and ginger. Pour the milk mixture into the dry ingredients and stir just until incorporated. Fold in the cranberries. Spoon batter into prepared pans (I use an ice cream scoop to make it easier) and fill each muffin cup about 2/3 of the way full. Sprinkle about one teaspoon of demerara sugar over the top of each muffin. Bake about 20 - 25 minutes until the tops are golden brown and spring back lightly to the touch. Cool in pans about 5 minutes and then transfer to a wire rack to cool completely. yummmm, these are my favorite! I made some on NYE morning too, of course-I just had to add milk to my packet :) lol. These look incredible, I'm bookmarking them for when I'm feeling ambitious! These look so good! The combination of cranberry and orange is like crack to me, plain old addictive! This is my husbands favorite muffin. I made them about four times and my husband just begged me again to make them. Thanks for the great recipe. In the oven now, anxiously awaiting! 15 minutes to go! Would craisins work in this recipe instead of the fresh or frozen cranberries? I haven't tried it, but I would think you could. The only potentially problem I could see was maybe they would be a little drier since the craisins aren't juicy like the regular berries would be. I need to bake 2 doz. muffins for church fellowship. Would this recipe make 2 doz. ?...also I have a big bag of dried cranberries and need to use them....what should I add to keep them from being dry? Thanks! Yes this will yield 2 dozen regular size muffins, I baked them in jumbo muffins so I only got a dozen. If you want to use dried cranberries, you can rehydrate them by soaking them in hot water for about 30 minutes and then draining them before adding to the batter and that will help. Is the baking powder tablespoons or teaspoons? T is Tablespoon, tsp is teaspoon.